A walk in the woods in winter reveals some deciduous trees still holding onto their dead leaves -- a phenomenon scientists called marcescence. Some oak trees (Quercus spp.) often fail to fully shed leaves in autumn, but this also happens to beeches (Fagus spp. ), witch hazels (Hamamelis spp.) and hornbeams (Carpinus spp.). Eventually these dead leaves do drop away, allowing swelling buds and new leaves to emerge in spring. Scientists do not fully understand why some oak trees fail to drop their leaves in fall. They do know that the abscission layer does not entirely form. In other trees, the abscission layer cuts the flow of water and nutrients to the leaf, which then dies and readily breaks away and falls to the ground. In oak species, the persistent leaves eventually do fall off even in some species that carry brown leaves through the winter. Heavy snow or ice or strong winds tear or beat the brown leaves off the branches. If some old leaves remain by spring, the swelling buds and emerging leaves push them off. 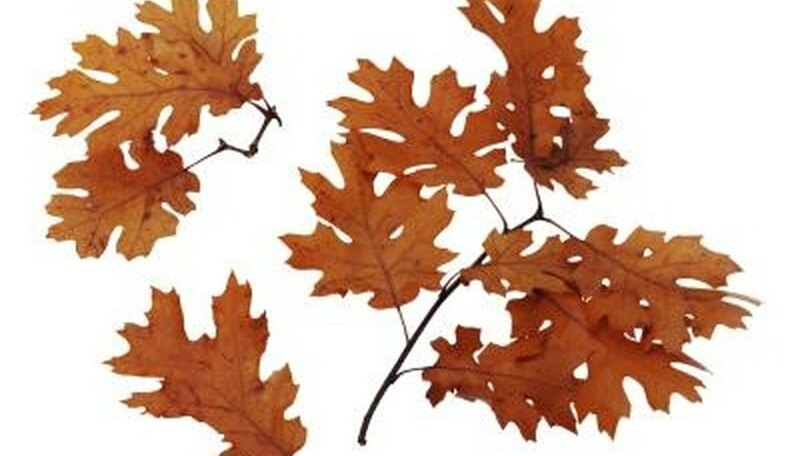 All oak trees may display foliage marcescence, even species that are known to fully drop leaves when the tree is mature. Seedling and young oak trees may awkwardly and irregularly hold onto leaves into winter, but with maturity, they manage to drop leaves in late fall. An example is the swamp white oak (Quercus bicolor). Moreover, within any oak tree, marcescent leaves may occur on inner, lower branches. Persistent dead leaves may always be seen on the wind or snow-shielded parts of oak trees, even those species that normally drop all their leaves by winter's start. Some oak trees consistently retain their dead leaves past the fall, regardless of their age. The foliage on these marcescent oaks drops away in differing amounts, varying by tree or branch or the climate in which they grow. Examples of oaks known to hold onto dead leaves include blackjack oak (Quercus marilandica), Stone Mountain oak (Q. georgiana), post oak (Q. stellata), pin oak (Q. palustris), scarlet oak (Q. coccinea), sawtooth oak (Q. serrata), English oak (Q. robur), and Chinese cork oak (Q. variabilis or Q. bungeana). This list isn't exhaustive. With unique genes, one tree may display marcescence, while nearby trees of the same species are fully deciduous, as is seen with some gambel oaks (Q. gambelii). Oak trees that normally shed their leaves promptly in fall may hold onto their foliage longer when an untimely, early frost or freeze occurs. The cold kills the leaves that may not have already shown color. The premature onset of cold and leaf death may also prevent the natural development of abscission layers in leaf stems. Therefore the leaves do not readily drop off as usual. Evergreen oaks, such as live oak (Q. virginiana and Q. agrifolia), retain their living leaves year-round but do shed their oldest leaves in spring just before young leaves appear. Evergreen oaks aren't referred to as marcescent. When Do Autumn Leaves Start to Fall?